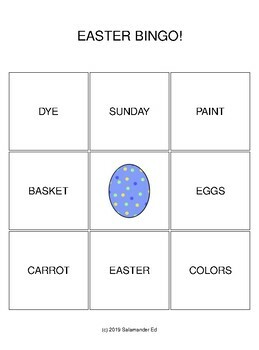 Easter 3x3 themed bingo game! 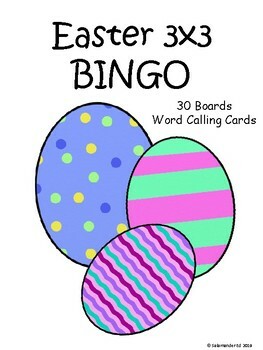 This bingo set includes 35 game cards each of which has a unique word arrangement. Clip art in the middle of each board is a "FREE space." Word calling cards are included. 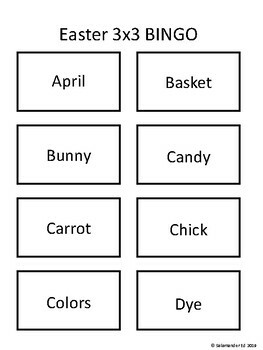 Nineteen words were used to create these bingo boards: April, basket, bunny, candy, carrot, chick, colors, dye, Easter, eggs, family, friends, hide, hop, hunt, paint, spring, Sunday, and treats. 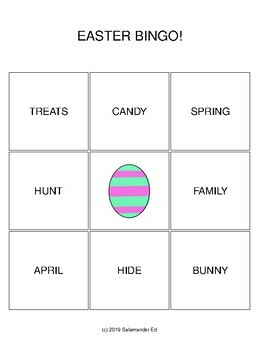 Fun game to celebrate Easter in the classroom. Great for beginning readers! Perfect for Kindergarten, first, second, and third grades. Just print and enjoy! Make the game last longer by playing until an "X" or "T" are formed on the bingo card!